Yours Truly Clothing | Out of every shop on the internet, this one is one of my favorites in general. They have simple dresses that are absolutely beautiful for building a Game Day wardrobe. The Mint Julep Boutique | Mint Julep has a ton of options for Game Day right now. Their dresses are a little more trendy, but they have some amazing options that would be perfect. 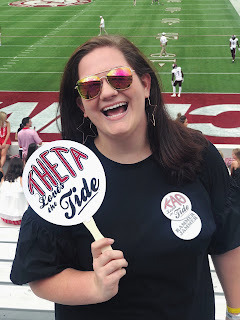 Sideline Sweetie | One of the things I love about this site is you can shop by individual schools, and it sorts all of their clothes into those school's colors. Again, more trendy but still wonderful. Bluetique Cheap Chic | Feel like we should've seen this one coming... I love Bluetique so much, and I love looking at all the pretty Kentucky blue since a lot stores cater to Georgia, Alabama and Auburn. Tailgate Queen | This is another shop where you can shop by school, and I don't know why, but looking at this website just makes me happy and pumped for game day. They also have super cute state pride shirts.